On September 27, 2015, the adult Sunday school class studied Exodus 35:20 through 38:8. This section describes the eagerness of the Israelites to contribute the materials and the work needed to construct the tabernacle. Both men and women “who were of a willing heart,” “whose hearts stirred them,” and “whose heart moved them” brought a freewill offering. The people’s contributions were so great they were asked to cease bringing material! The Lord loves a cheerful giver (2 Co 9:7). Also the Lord filled Bezalel and Oholiab with the Spirit of God giving them skill, intelligence, and knowledge as craftsmen and with the ability to teach others. In many respects this section anticipates the spiritual gifts given to church members. Chapter 36 describes Bezalel’s crafting the curtains, frames, pillars, and bases for the tabernacle structure. This section largely duplicates the designs for these items previously given to Moses in Chapter 26. Listen to “Bezalel and Oholiab” (Exodus 35:20-38:8) at mcopc.org. On September 20, 2015, the adult Sunday School class studied Exodus 34:29 through 35:19. The last verses of Exodus 34 record the seventh and final descent of Moses from Mount Sinai. He brings with him the tablets of the testimony. His face shines as a result of his time with God and the lingering effect of his having been shown God’s glory (33:18). This appearance serves to authenticate Moses as mediator and leader, God’s presence and guidance, and the Law. Based on 2 Corinthians 3:7 through 4:6, in the face of Moses we see the glory of any person who meets with God by faith through his word. That is, being with God has a transforming effect on people. Also in this passage we see the glory of the gospel as the old covenant fades away. In chapter 35 we see Moses resuming his discussion of the sabbath after he was rudely interrupted after 31:18 upon his finding Israel engaged in idolatry. Moses then proceeds to announce God’s commands regarding the tabernacle. He solicits contributions and craftsmanship from the Israelites. He orders the manufacture of the the tabernacle, particularly listing the seven articles of furniture (35:12-16). Note that this is the third such listing. The first was in chapters 25-30, and the second occurs in 31:7-9. There will be seven such listings before Exodus is concluded. Listen to “Shining Face of Moses, Sabbath Regulations, Contributions for the Tabernacle (Exodus 34:29-35:19)” at mcopc.org. On August 23, 2015, the adult Sunday school class studied Exodus 32:1-29. The first six verses describe the idolatry of the Israelites as they construct the golden calf. It had not been long ago that they heard God speak the Ten Commandments to them. But now they blatantly violate the first three of those. – Moses asks God to remember the covenant he made with Abraham, Isaac, and Israel. Verse 14 states that God relented of the planned disaster. We must think of this as an anthropomorphism. That is, this section describes God’s thoughts and actions as if he were a man. This section displays Moses as the grand intercessor and mediator for his people. In this role he typifies the ultimate intercessor/mediator, our Lord Jesus Christ. In verse 25 Moses descends from the mountain and upon seeing the idolatry in the camp he breaks the tables of the testimony realizing that his people are unable to keep these commandments. Listen to “Golden Calf, concluded” (Exodus 32:1-29) at mcopc.org. 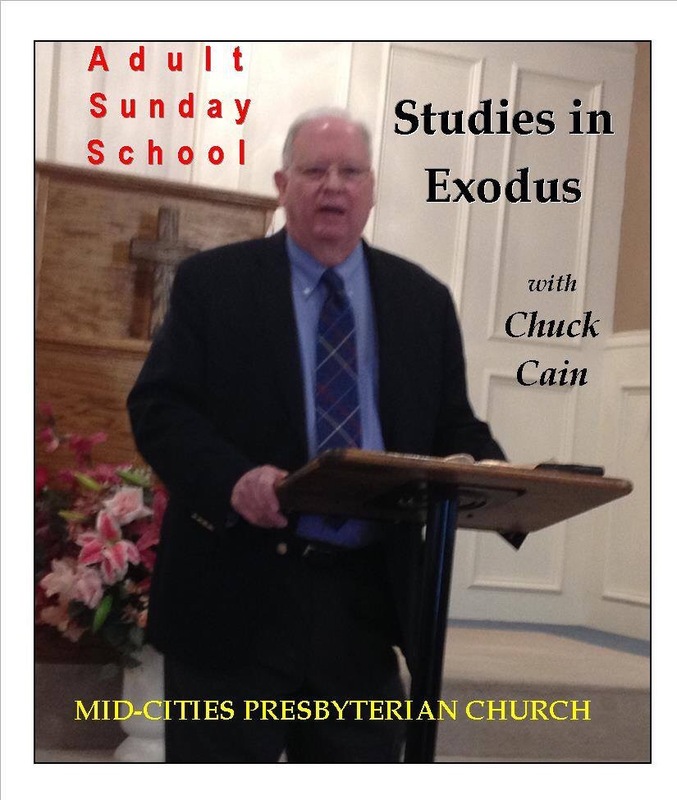 On August 16, 2015, the adult Sunday School class reviewed Exodus 31:12 through 32:6. In the last section of Exodus 31 the LORD gives Moses further commands regarding the Sabbath. The LORD had provided commandments regarding the Sabbath before in chapters 16, 20, and 23, but three additional issues are provided at this point. The first is that “above all” the Sabbath is to be kept during the construction of the tabernacle. The verses immediately preceding identified the artisans responsible for the construction, so here the LORD commands that there will be rest on the Sabbath. Second, these verses reveal that the Sabbath is a sign of the covenant and that its observance would result in increased knowledge of the LORD. Finally, for the first time a penalty is identified for failure to observe the Sabbath. That penalty was death. We too are to rest on the Sabbath and engage in corporate worship and learn more on that occasion about the LORD through Bible study and worship. Fortunately the penalty of the civil law has been suspended (else our population would be greatly reduced). But the penalty highlights how serious the LORD considers faithful Sabbath observance even in our day. For the New Testament church, the Sabbath is observed on Sunday recognizing that something equally important to creation rest has occurred: the resurrection of Jesus Christ on the first day of the week. Listen to Sabbath Commands and the Golden Calf (Exodus 31:12-32:6) at mcopc.org. On July 26, 2015 the Adult Sunday School Class reviewed the incense altar and the census tax in Exodus 30. The first is a description of the incense altar. One would wonder why it is described here rather than in Chapter 25, where the other four furniture items inside the tabernacle are described (the ark of the covenant, the mercy seat, the bread table, and the lamp). This description forms an inclusio with 27:20-21 which speaks of the priests’ daily tending to the lamps; whereas, 30:7-8 speaks of the priests’ daily tending to burning incense. In the midst of this inclusio in Chapters 28-29 is the description of the priests’ garments and consecration. This is to say that a description of the priests’ daily duties serve as bookends surrounding their ordination. The burning of incense likely symbolizes prayer, both of the people’s prayer to God and our Lord’s intercession for his people. The linkage of incense and prayer is found in other passages such as Psalm 141:1-2, Luke 1:5-11, and Revelation 5:8 and 8:3-4. Note that the design, as well as the name, of this article of furniture is almost identical to that of the bronze altar in the courtyard. They are both square and have horns. Perhaps this is to remind us that a life of prayer depends on a sacrifice for sin. The second subject discussed in Chapter 30 is the census tax. In Exodus 30:11-16 the LORD tells Moses that when a census is taken each person is to pay a half-shekel tax to “ransom his life” (verse 12) and “to make atonement for your lives” (verses 15 and 16) “that there be no plague among them when you number them.” These frightening statements are likely a reminder that the people are not their own, they belong to God who has redeemed them. The taking of a census could tempt pride in numbers and achievement. The tax would remind them that they were bought with a price (1 Corinthians 6:19-20 and 7:23). Listen to “The Incense Altar and the Census Tax” (Exodus 30) at mcopc.org. On Sunday, July 19, 2015, the Adult Sunday School Lesson completed a review of Exodus 29 regarding consecration of the priests and the altar. Three animal sacrifices are identified as part of the ceremony. In each case the blood of the animal is applied in various ways to the altar. The first sacrifice is a bull for the sin offering. Curtain organs are burned on the altar. The remainder is burned outside the camp. Hebrews 13:11-12 identifies this practice as a foreshadowing of Jesus being crucified outside the city as a sacrifice for our sin. The second sacrifice is a ram for the burnt offering. This offering represented full commitment of the priests and the people. The third sacrifice is a ram for the fellowship offering. This offering is also identified elsewhere as a peace offering or wave offering. In this case after specified organs are burned on the altar, the breast and thigh are eaten by the priests symbolizing a fellowship meal between them (and the people) and God. The order of these three offerings differs in Leviticus as identified by J. A. Motyer. In Exodus 29 the order highlights individual need for being forgiven. In Leviticus 1-5 the order is burnt offering (1:3), fellowship offering (3:1), and sin offering (4:2-3) highlighting the order of divine desire. In Leviticus 6-7 the order is burnt offering (6:9), sin offering (6:25), and fellowship offering (7:11) highlighting the order of priestly ministry. Exodus 29 states that the consecration ceremony for the priests was to last seven days. Listen to “Consecration of the Priests and the Altar” (Exodus 29) at mcopc.org. On July 5, 2015 the Adult Sunday School Class reviewed Exodus chapters 27 and 28. Having completed chapters 25 and 26 which describe the tabernacle structure and its contents, we step outside “heaven” into the tabernacle courtyard depicting “earth.” Here we first encounter the bronze altar on which animal sacrifices will be offered for sins. The design of this altar is described in Exodus 27:1-8. The remainder of this chapter describes the courtyard fencing which is to be 150′ by 75′. Also described is the beautiful gate to the courtyard. 1. The Holy of Holies where God’s glory was to reside above the cherubim of the mercy seat. Only the designated high priest could enter there, and then only once a year on the Day of Atonement with blood. 2. The Holy Place where only the designated priests could enter to service daily the incense altar, the bread table, and the lamp. 3. The courtyard where Israelites could enter to bring their sacrifices to be offered up by the priests. 4. Outside the courtyard would reside the rest of the world, the Gentiles, the uncircumcised, the unbelievers. Listen to “The Courtyard, Bronze Altar, Priest’s Garments“ (Exodus 27-28) at mcopc.org.